Professional bass player Steve Webster sits on a bench in a downtown park, explaining “being at home in Toronto, I kept dreaming of coming back to Oaxaca; I needed to be here.” But it took becoming burned out over the course of more than three decades, first touring Canada, the US and Europe with rock bands, and then going to the office and feeling the daily pressure to produce TV commercial jingles, for him to come to that realization. 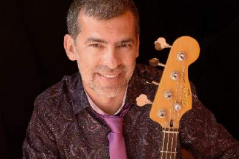 The 55-year-old Canadian began playing bass at age 12, embarking upon his career at just 20. He spent the early part of the 1980s playing the Toronto Queen Street scene with upwards of a dozen New Wave groups. During this phase of his career he co-wrote the hit single Rise Up, recorded by The Parachute Club, one of the first mainstream pop acts in Canada to incorporate world music influences into their sound. “Touring as part of a rock band is exhausting,” Webster reveals. “And it can be boring, whether on a bus or in a plane, in the hotel room or en route to the next venue, you’re travelling 22 hours a day, all for those two exhilarating hours on stage,” he confesses. “That’s why you hear of rock musicians doing crazy stuff,” he surmises, without getting into his own folly during that era in his life. After having had enough of “all the trappings of a rock & roller’s lifestyle,” and thoroughly fatigued, he flew to Tulum where he spent two cathartic weeks sleeping on a beach, with little in the way of modern amenities, not even electricity. It was the first time in his adult life that he had been able to decompress. It was there that he had an epiphany. When he returned home, he resolved to do two things: learn Spanish, and get out of the rat race “it’s no way for people to live, at least not me”. Webster began studying Spanish at a community college in Toronto. His next Mexican sojourn was to Mérida. He subsequently began his quest to learn about other regions in the country. A friend told him that if he liked Mexico so much, he had to visit Oaxaca. It was during the early 2000s when Webster visited Oaxaca for the first time. He met famed songstress Lila Downs and her music director / husband Paul Cohen at a party sponsored by the recording artists’ pet charity, Casa de la Mujer (the scholarship program now known as Fondo Guadalupe Musalem A.C.). A couple of days later he attended a Lila Downs benefit concert. Webster returned home. But Oaxaca had done something to him. Within a year he had left his TV commercial jingle business and traveled to Oaxaca where he remained for six months. Though he returned to Toronto, his heart remained in Oaxaca. He came back to Oaxaca in 2007/2008, by then realizing that he had to live here. In or around 2012, he again saw Paul Cohen, after the conclusion of a Toronto concert, so approached him. Cohen recalled Webster not from the earlier introduction in Oaxaca, but rather because they had communicated while Webster was working on an Oaxaca tourism website he had helped develop, http://www.oaxacacalendar.com. Webster moved to Oaxaca permanently in January 2013. “I played for about a month at a club upstairs from the Los Danzantes restaurant here in Oaxaca, La Medida, and on the odd Tuesday I’ve played at the jazz restaurant, Nueva Babel, with author Kurt Hackbarth,” says Webster. He ran into Cohen on the street, and they spent a couple of hours together chatting. Then earlier this year Cohen contacted Webster and asked him if he’d be interested in playing bass with him and some friends at Casa Colonial, a downtown Oaxaca bed and breakfast. As it turned out it was an opportunity for Lila Downs to try out some new material. Steve Webster is now a permanent fixture in Oaxaca. At this point in his life he’s paid his dues. “All I want to do now is play music for enjoyment, with good musicians who are nice people, like Paul,” he confides. Who knows, perhaps a tradition will now begin where Webster is an invited guest musician at Lila Downs’ annual May benefit concert in Oaxaca. Alvin Starkman operates Mezcal Educational Excursions of Oaxaca, and can be reached at mezcaleducationalexcursions@hotmail.com He’s been instrumental in teaching Webster all about mezcal, perhaps another reason that Webster now calls Oaxaca home.